Just because you had braces as a kid doesn’t mean you’ll never need them again. That’s due to the fact that teeth tend to shift a bit throughout the years, especially if you lose a tooth or didn’t wear your retainer as much as you should have. Braces can get those pearly whites back where they belong, leading to easier oral hygiene, a well-aligned bite, and a more attractive smile. Even if you’ve never had braces, it’s not too late to correct the alignment issues in your mouth. Shifting crooked teeth into place can protect them from premature wear and tear and help you project a more professional image. Because straight teeth are easier to clean, they reduce the risk that harmful bacteria will wreak havoc in your mouth. Therefore, you’ll have a better chance of preventing tooth decay and gum disease. Fighting gum disease is particularly important; it has been associated with some severe health conditions, including cardiovascular disease and dementia. An attractive smile can help out your mental wellness. 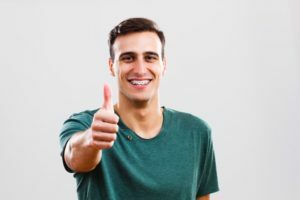 When you’re confident about the way your teeth look, you may be less self-conscious in social situations and project a friendlier, more approachable image. You may experience fewer headaches. Tooth and jaw misalignment can place extra stress on your jaw and facial muscles, which can translate into head and neck pain. Correcting such alignment issues can help your orofacial structures relax. If you need braces, you won’t necessarily be stuck with traditional ones made of metal wires and brackets. You might ask your orthodontist about lingual braces, which are invisible to the outside world because they’re placed on the backs of your teeth. Or, you may be a candidate for ceramic braces, which have a subtler appearance than their traditional counterparts. Many adults choose clear plastic aligners, such as Invisalign or ClearCorrect, to get their teeth into place. Think you’re too old for braces? Think again. No matter what your age, orthodontic treatment may be able to do wonders for your oral and overall wellness. Dr. James Hart has been practicing orthodontics since 1978. Dr. Hart’s extensive experience and dedication to helping his patients achieve better health enable him to provide excellent service to the Cleburne community. If you believe you may be able to benefit from adult braces, contact our office at 817-645-2432.